In this column an exposition is given of the so-called transformation problem in the theory of Karl H. Marx1. This problem deserves attention, because it has been used by adversaries of Marx to discredit the marxian theory. The first criticism of the transformation was already passed in 1907 by the economist L. von Bortkiewicz. In the sixties this criticism has been formulated in a more clear and understandable way by P. Sraffa and his followers. The marxist theoreticians did succeed in refuting the criticism of von Bortkiewicz and Sraffa, but this did not yet rehabilitate the theory of Marx. It remained unclear, what Marx tries to say. Only recently, in 2007, did the economist A. Kliman publish an explanation of the theory of Marx, that restores the logic in its entirety2. Incidentally, the formula 1 is also valid for each separate product, and for the total production within an economic branch. In this sense she has a universal validity. In the formula c represents the value of the used means of production (expressed in the labour time, that was needed for the production of those means of production), and v is the value of the package of goods, that the personnel receives in exchange for their working on the product C'. The components c and v are called the constant and variable capital, respectively. The component m is typical for the capitalism, and is called the surplus value. This is the value (of course also expressed in labour time), that the workers add to the product C' without receiving a compensation. The producers appropriate the surplus value m for themselves, and thus realize an income for themselves. In the price system, such als is visible in the actual society in which we live, m is equal to the total profit π.
Marx is an artist in the use of language, and he calls this appropriation of m by the producers an exploitation of the workers. Incidentally in his time, when the inequality in wealth was still poignant, this was a fairly accurate description. Then he defines the ratio m/v as a measure of exploitation. He calls it the degree of exploitation, or sometimes in a more neutral tone, the rate of surplus value, and he represents it by the symbol m'. Marx assumes that the workers can estimate in a reasonably accurate manner how large the degree of exploitation m'i in their own enterprise i actually is. For a high degree of exploitation means, that the workers in the enterprise must make relatively long working days in order to produce the large profits of their employer. The workers will resent to remain into service of such an extreme employer. Therefore according to Marx the rate of surplus value m' is nearly equal for all producers. A general average rate of surplus value is prevalent in the system. The formula 4 is the so-called price transformation, that Marx uses to calculate the product prices from the product values (in labour time). The transformation formula takes into consideration, that the invested capital must yield a general average profit rate r* on the capital market. If this would not be the case in a certain branch, and for instance the profit rate would be below the average, then the capital would leave this branch. In other words, the competition on the capital market forces all production to yield the same general average profit rate. The price formula 4 has a curious consequence. According to the formula 1 the producer i generates an amount of products Qi with a total labour value of Ci+mi. On the other hand, the formula 4 states that his nominal yield of money is equal to Ci + r*×Ci. Can the labour value of Qi coincide with the price sum? That is to say, is mi = r*×Ci possible? Is the general average profit rate already valid on the level of the individual producer? The definition of the rate of surplus value leads to the relation mi = r*×Ci. Apparently the produced surplus value depends only on the hired quantity of labour vi (because m' is a social given), and not on ci. Therefore there is no reason, that the surplus value mi of the individual producer i should match r*×Ci. At the level of the separate company i this will mostly not be the case. Apparently it can be concluded from the price transformation 4, that the value production and the monetary yield are separated at the level of the individual producer. Some producers will make more profit than they generate as actual surplus value, and other will make less profit. Producers that hire a relatively large amount of labour, produce a relatively high surplus value, and will have to transfer a part to others. And producers that prefer to automate, and thus do not hire much labour, produce a surplus value below average. They will receive a compensation. The existence of the general average profit rate on the capital markets leads to a redistribution of the total social surplus value. Of course the redistribution is not a conscious process, but it happens as it were behind the backs of the producers, simply because they do their calculations in prices and not in labour values. Marx assumes that the redistribution does not reduce the labour value in the society as a whole. That is to say, after the redistribution the value of the total product C' and the profit m remain unaffected. Since m' is determined by the society, one finds m'i=m', and a different oi has the automatic implication of a different r*i. If oi is above average, then the profit rate in the branch i is too low, and it will be compensated by means of a redistribution of the surplus value until the level of the general average profit rate is reached. It has just been said, that in 1907 the first critique is published with regard to the price transformation of Marx, like it is shown in the formula 4. However the arguments of the critics did not yet excel in clarity. A more convincing exposition of the transformation problem is given in 1976, by W. van Drimmelen5. 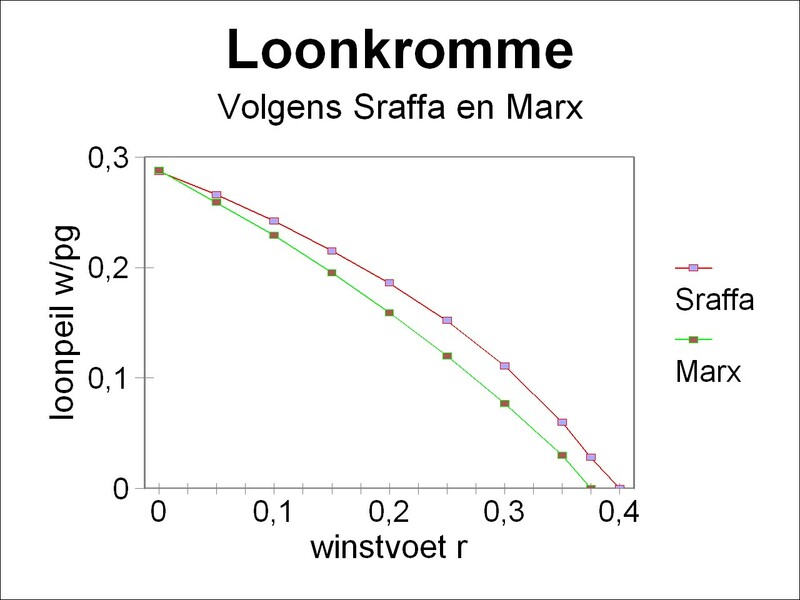 Van Drimmelen believes that Marx makes a mistake by calculating the general average profit rate by means of the labour values m and C. For the producer does not know the labour values, and fixes his product price on the basis of money prices. In other words, he calculates his product price by means of the profit rate r, which the capital market dictates for the efficiency of its lent capital sums6. If the price sum of the production costs, namely the advanced money capital for the means of production and for the workers, is represented by Γ, then one finds r=π/Γ. Apparently the arithmatic method of Marx is only meaningful as long as the profit rate in labour values r* is equal to the profit rate in money prices (that is to say, r*=r). Marx believes that this is the case, for he assumes (like already has been remarked) that on the social (macro-economic) level all labour values remain conserved and thus m=π and C=Γ. Van Drimmelen shows that in general this will not be true. To that end he construes an example, that displays the absurdity. Suppose that the producers together spend their entire monetary profit π and thus their surplus value m, on luxury goods. These are goods, that bring pleasure, without adding to the production process. Suppose in addition that the organic composition in the branch of luxury goods is very low. In the preceding paragraph it is explained, that a mechanism of redistribution will be started. In the exchange on the markets the branch of luxury goods can not claim its generated surplus value in its entirety, but it is forced to hand over a part of its money claim to the other branches. Thus the price sum of the luxury goods falls below its labour value. The luxury goods are not sold with a profit m, but with a smaller profit π. In the example of Van Drimmelen the other (remaining) branches in this economy produce the means of production and the wage goods. The value sum of their total product is C, and the price sum is Γ. Since the example assumes that these branches have a higher organic composition than the branche of the luxury goods, the mechanism of redistribution will raise the price sum Γ above the value C. Apparently the equality of the price sums and the value sums (π=m, Γ=C) is violated. In other words, the monetary profit rate r would differ from the profit rate r* in labour values. The find of Van Drimmelen is original, as far as it shows in a clear way the role of the organic composition in the transformation problem. The economist E. Feess-Dörr illustrates in a slightly different way the transformation problem7. He abandons the idea of the luxury branch, and considers an economic system with two "departments"8. Suppose that the physical composition of the package of products, that respresents the surplus value m, is different from the composition of the package of products, that represents the advanced capital C. This is for instance the case, when the economy does not grow, so that the means of production and the army of workers are not expanded. In that case the producers will be forced to consume their entire surplus value. In other words, the surplus value is generated only by the department (branches) that produce consumption goods. On the other hand the advanced capital C also contains all kinds of means of production. In general there is no reason why the organic composition for the production of the consumption goods should be equal to the organic composition for the production of the means of production. Also here the surplus value of the producers must be redistributed in order to guarantee the general average profit rate. Again the equality of the monetary profit π and the surplus value m would be destroyed. The profit rate r* in labour values would differ from the profit rate r in price sums. Of course the argument of Feess-Dörr is principally the samen as that of Van Drimmelen. An example may help to illustrate the effect and the impact of the transformation problem. In particular it gives an impression of the deviations of the marxist prices with respect to the real prices. The real prices can be calculated with the theory of Sraffa, which has already been introduced in a previous column. In the theory of Sraffa the calculations can be performed without dubious assumptions like π=m and Γ=C. There, in that previous column, an example is used, that will be copied in the present column9. The economic system consists of two branches, namely the agriculture (index g) and the industry (index m). The agriculture produces corn (expressed in bales) and the industry produces metal (expressed in tons of weight). Table 1 gives a survey of the quantities. For the explanation of the symbols in the table 1 the reader is invited to just consult the previous column. This is advisable anyway, because in the following also the numerical results of that column will be used. In the set 7a-b ηg is the labour value of a bale of corn, and ηm is the labour value of a ton of metal. In the previous column about the theory of Sraffa it is explained that it is preferable to eliminate the aggregate quantities Qg and Qm by means of a division. Then a set of technical coefficients is left, that depend exclusively on the applied technology. Table 2 summarizes the values of the technical coefficients, such as correspond to the table 1. In the formula 9 I is the unity matrix, and the upper index -1 indicates that the inverse matrix of I − A should be taken. From this solution it follows that a bale of corn is worth ηg = 3.479 labour units, and a ton of metal is worth ηm = 21.74 labour units. It is characteristic of labour values, that they do not depend on the distribution of the added value over the wages and the profits - this in contrast with the prices. Note that w is a transformation of the rate of surplus value m'. For from the formula 6 and the definition of the rate of surplus value it follows that w = v/l = 1/(1+m') holds. Therefore the formula 12 also shows how the general average profit rate originates from the rate of surplus value. The formulas 11 and 12 complete the price transformation of Marx. Thanks to the labour theory of value this price theory does not need the numéraire, in contrast with the theory of Sraffa. Now all is ready to illustrate the transformation problem in a comparison of the prices according to Marx and Sraffa. In this column the differences are shown by means of graphical presentations. The portraiture of the curves in the same figure requires that also the prices of Marx are normalized with the numéraire pg, just like in the example for the theory of Sraffa. In addition the wage level w must be converted. This is so, because in contrast with Marx the wage sum of Sraffa is not included in the advanced production capital12. In this way the quantities calculated with the theory of Marx are transformed, and they are added to the figures 2 and 3, which have already been incorporated in the previous column about the theory of Sraffa. Here the result is shown in the figures 1 and 2. It is immediately striking, that in the case of a profit rate r equal to zero the results of Sraffa and Marx coincide. This is obvious, because then the workers receive the entire production, and thus the prices and labour values are the same. In this situation the surplus value is absent, so that a redistribution is not necessary. According as the profit rate increases, there is a growing discrepancy between the price transformation of Marx and the price system of Sraffa. This is particularly striking for the capital intensity κ/pg in the figure 2, where the difference becomes quite large. Incidentally here also the marxist κ-curve exhibits an upward trend, although in a moderate way (in contrast with the expectations of the neoclassical theory). In any case the two figures clearly illustrate the transformation problem13. In the example this problem occurs, because the organic compositions in the agriculture and in the industry are different. In the agriculture she is og=1.087/w, and in the industry om=5.71/w. Note that apparently the magnitudes of the organic compositions do depend on the distribution, but that their relative proportions are not influenced by her. Of course the profit rates in the branches r*g = mg/Cg en r*m = mm/Cm are also different, due to the formula 5. The figures 1 and 2 show that the theory of Marx does not succeed in compensating the profit rates in the two branches in such a way, that they transform into the profit rate according to Sraffa. The tranformation problem can only be solved, if the theory of Marx is interpreted in another way. For this consult the book of A. Kliman, that is mentioned in a footnote. 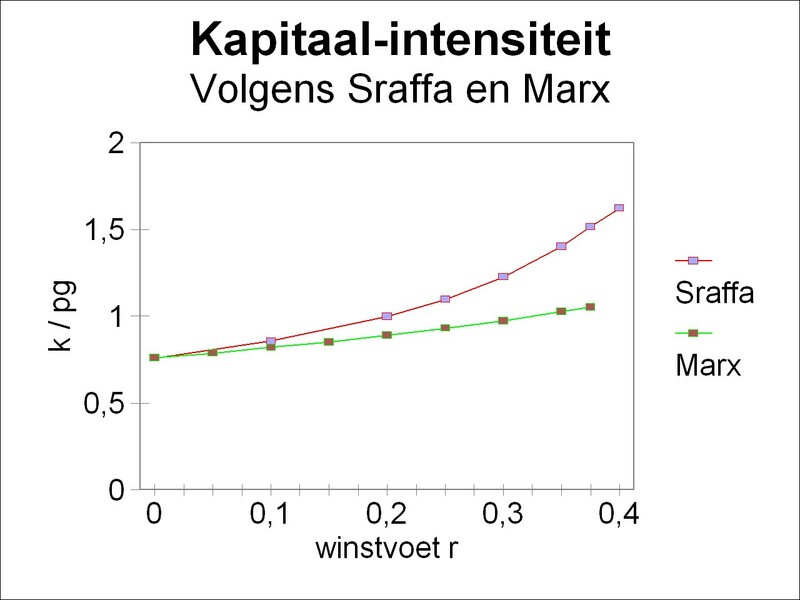 Finally it must be remarked, that the wage curve and the curve of the capital intensity, that are calculated here with the theory of Marx, differ from those in the proof-text Vooruitgang der economische wetenschap. The marxist curves in the figures 8.7.1 and 8.7.2 of the proof-text are wrong.